A recent paper describes an unusual discovery: dead squid littered across the deep sea bottom of the Gulf of California. 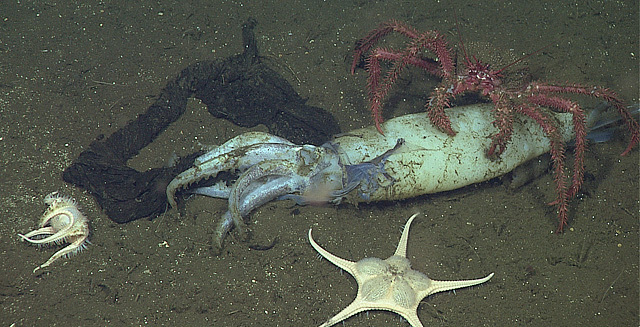 It’s a squid graveyard that might be a boon for deep-sea animals. The research was led by Henk-Jan Hoving, former postdoctoral fellow at MBARI and now a biologist at GEOMAR Helmholtz Centre for Ocean Research Kiel in Germany. Hoving and colleagues first spotted the squid remains during a 2012 remotely operated vehicle (ROV) dive in the Gulf. With an egg sheet blocking their ability to feed, female deep-sea squid fast while their eggs develop. By the time the babies have hatched and swum away, a mother squid will have used up all of her stored energy and resources. The carcasses that the researchers found were likely these females, accompanied by the remnants of their reproductive efforts. 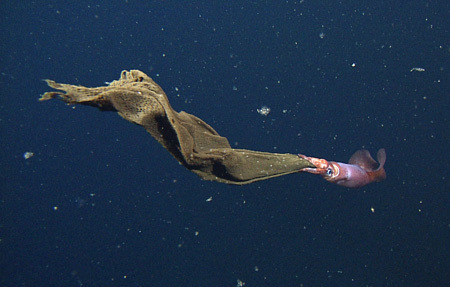 After the 2012 expedition, Hoving and colleagues asked fellow researchers for other similar sightings of squid and egg sheet remains. But it wasn’t until 2015 that he was able to return to the Gulf as a guest researcher with the MBARI Midwater Ecology Group and collect more observations. Over 11 ROV dives in the Gulf during 2012 and 2015, Hoving and the MBARI team discovered 64 dead squid or egg sheets scattered on the bottom. Most were found deeper than 1,000 meters (almost 3,300 feet) in the Cerralvo Trough, a deep basin near the southern end of the Gulf. Because food is so scarce in deep water, the appearance of these squid and their egg sheets would seem to be a stroke of luck for animals on the seafloor. The scientists noted that the recently-deposited squid carcasses had already attracted ratfish, acorn worms, brittle stars, sea cucumbers, crustaceans, and sea stars. Although the squid carcasses attracted plenty of scavengers, the egg sheets seemed relatively undisturbed. Other researchers have suggested the squid might incorporate ink into their egg sheets, making them less palatable to decomposers and bacteria; Hoving and the team speculated that they might take longer to disappear than the more easily-digested squid. 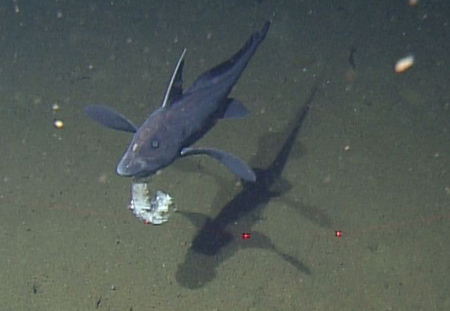 The remains could represent a scattered but significant food source for animals in the deep. The team’s research illustrates a link between animals in the midwater (the zone between the surface and the bottom) and the seafloor. Sinking squid carcasses are part of what oceanographers and biologists call the “biological pump”—a process by which carbon is transported from the surface of the ocean to the depths. Conventionally, most carbon is assumed to drift slowly downward in the form of marine snow. But if large numbers of squid collect food in the midwater and then sink, this could speed up carbon transport in some areas or times of the year. December 3, 2018 – A new study by MBARI scientists shows that pulses of sinking debris carry large amounts of carbon to the deep seafloor, but are poorly represented in global climate models.